If you’re eating ice cream for the first time, how would you know that it’s the best tasting ice cream in the world? The only way we can accurately analyze something – whether or not it’s in relation to fantasy football – is through comparison. If NASA finds a lake full of water on another planet, the reason they’d hypothesize that life was on that planet is because they know life relies on water to survive. If we all relied on coal to live, then finding water wouldn’t matter. How do you know something is expensive? Well, it’s because you’ve lived in a society where people and businesses sell things. You see something in a store, and in your mind, compare it to something of equal value. If it costs a lot more money than the equally valued product, you’d conclude that it’s expensive. Here we go again with my favorite word: value. Defined as relative worth, value allows us to analyze a group of things through comparison. Joe Bryant coined Value Based Drafting in fantasy football’s Stone Age, and the concept still holds true today. Essentially, VBD tells us that the number of fantasy points a player scores is irrelevant until that player’s score is compared to the number of points scored by his peers. In other words, Ray Rice’s total compared to Aaron Rodgers’ sum is beside the point. What we really should care about is Ray Rice compared to guys like Arian Foster or Adrian Peterson. Bryant’s teachings are all over the Internet now. They serve as the basis for many fantasy owners’ drafts. But really, the idea behind VBD shouldn’t be thought about only at draft time. Sure, the notion is draft related, but the fundamentals can and should also be used after August, too. You see, we can’t analyze how a player did in the previous season, in terms of fantasy production, without comparing how he did in relation to his position. If Randall Cobb scored 200 fantasy points in 2012, what does that tell me? Nothing. I’ve just associated a number with Randall Cobb, and without a comparison, that number holds no meaning. This is so obvious, right? Because we study football and have mounds and mounds of historical data on the sport, we have this general sense of automatic comparison. If I say, “Matt Ryan threw for 4,000 yards last season,” an above average football fan would conclude that Matt Ryan had a pretty good year. Imagine if I said that to a geriatric living in a retirement home; one who had never watched a lick of football in his life. Aside from the “Who?” response I’d probably get, the “What?” reply would be just as important. The number 4,000, to that geriatric, is pointless. This is getting somewhere, I promise. It’s hard to be a week-to-week auto-producer at wide receiver in today’s NFL. Not only is a wideout’s weekly play dependent upon his quarterback’s ability, but the league’s spread offenses have made it even more difficult for number one pass catchers to see a steady number of targets and catches each week. Weekly analysis shows this, too. In 2012, there were only 12 receivers who finished with a weekly top-24 ranking eight or more times (excluding Week 17). At running back, this number was 20. 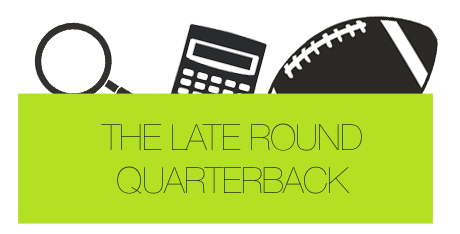 And when it comes to top-12 quarterbacks (remember, we’re starting just one passer on each standard 12-team league), 10 finished with a top-12 weekly rank eight or more times. The reason receivers are usually devalued early in drafts – or why you don’t see them selected in the early-first round all that often – is because cumulative point totals don’t look attractive at the position. If you were to compare the best wideouts to the worst starters in a 12-team league over the last few seasons, the typical variance would be lower than quarterbacks and running backs. I can’t say it enough: It’s hard to be a consistently good fantasy wide receiver in today’s NFL. Jones had four games in 2012 where his fantasy total didn’t reach the five point mark. And moreover, the Falcons’ pass catcher had just four 100-yard games. If we’re looking at Jones only, the numbers don’t appear pretty when analyzed independently. So was he inconsistent, even though he finished as a top-10 fantasy receiver? No, he wasn’t at all. He’s just a wide receiver. To elaborate, I took a look at each performance from the yearly top-10 running backs and wide receivers from 2012, excluding Week 17, and analyzed the volatility of these numbers. Because running backs typically score more points than receivers, using only standard deviation as a comparison tool won’t be sufficient. In other words, the spread of points at running back is greater because they score more and still have dud games. Using standard deviation wouldn’t be enough. Instead, I’ve used the coefficient of variation, which takes both the standard deviation and mean of a data set to come up with a number that can be compared across multiple sets of data. Quite simply, the coefficient of variation is equal to the standard deviation (a measure of the data’s volatility) divided by the average of the data set. The standard deviation of the 150 performances analyzed at wide receiver in 2012 was 7.27. At running back, this number was 7.65. Initially, you may think this means top-notch running backs are more up-and-down than receivers, but when you look at the coefficient of variation, you see that’s not the case. Receivers had a coefficient of variation of .60, while runners saw a coefficient of variation of .52. Remember, this number factors in the mean of the data. The closer to zero, the more predictable or less risky that data set is. These numbers may mean nothing to you. I wouldn’t be surprised if they do mean something, actually. But they certainly shed light to the fact that top wide receivers, naturally, have more volatility than running backs do in fantasy football. And considering the obvious consistency week-to-week from top quarterbacks [side note: don’t take this as them being valuable], it’s clear that the best wideouts are the most inconsistent of the big three positions in fake pigskin. This doesn’t mean we should push aside the receiver position at draft time. Though the top-10 pass catchers are riskier than top-10 running backs, the coefficient of variation actually gets larger at a faster rate as you move down the wide receiver ranking list. To put another way, the position becomes even more volatile outside the top-10 compared to other ones in your fantasy football lineup. Alas, this is why elite receivers mean something to fake football. The position is risky. 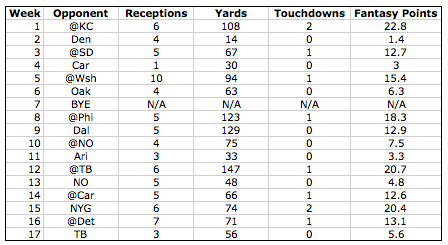 I mean, there were almost 100 different receivers ranking in the weekly top 24 at least once in 2012. It’s unpredictable. But to satisfy this irregularity, fantasy football owners should look to get the predictable, scarce receiving assets. And the only way to do that is to draft them early. You may have had one amazing scoop of Mint Chocolate Chip, but you won’t know that flavor is the best if you’re not trying other tastes of ice cream. Venture out and do your homework.